Stock photo of side view of the Esplanade Riel Bridge, a pedestrian bridge crosses the Red River in the City of Winnipeg, Manitoba, Canada. A side view of the Esplanade Riel Bridge, a pedestrian bridge crossing the Red River. This stock photo shows a side view of the Esplanade Riel Bridge, a pedestrian bridge crosses the Red River in the City of Winnipeg, Manitoba, Canada. This interesting view shows how the cables are suspended by a vertical pencil shaped pole atop the half-circular building. The cables fan out from this pole to support the bridge. The foreground to the right shows the concrete columns underneath that also support the bridge. In the foreground, is a concrete walkway that views the Red River and the suspension bridge. On the walkway is a lamp post next to a plague. In the background of the pedestrian bridge is the City of Winnipeg with it's different architectural buildings. The Red River flowing calmly under the bridge. 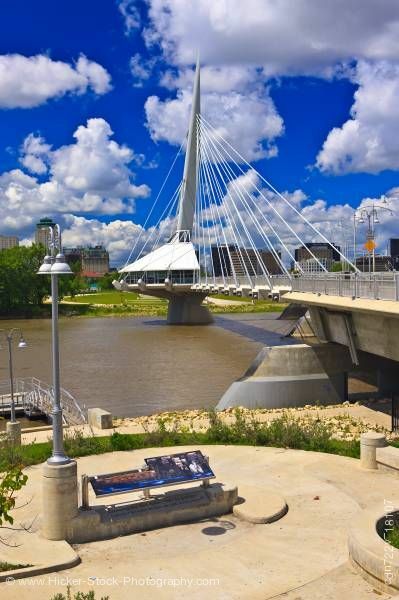 Esplanade Riel Bridge, a pedestrian bridge spanning the Red River in the City of Winnipeg, Manitoba, Canada.